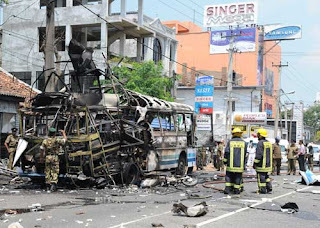 LTTE terrorists have exploded a bomb inside a public transport bus in Mount Lavinia, in the South of Colombo city around 10.55, this morning targeting innocent civilians. According to the available information, the bomb has been exploded in a privately owned bus that was plying from Moratuwa to Colombo. Due to the explosion 18 people including 10 males, 7 females and one baby have suffered minor injures. The bus and a motorbike parked nearby have been destroyed. However, the terrorists' beastly intention to commit carnage against civilians has foiled due to the vigilance of the civilians themselves. According to the defence.lk reporter at the scene, one of the passengers having noticed a suspicious parcel has informed the driver and the conductor of the bus. The conductor has alarmed the passengers and asked them to vacate the bus as soon as possible. At the same time, the driver of the bus has taken the bus to a safe distance from the civilians and informed the police, he said. Few minutes after driver got down from the bus, the bomb has gone off, he added. According to our sources, unless for the responsible behaviour shown by the bus conductor, the driver and the passenger who alarmed them; a large number of civilians would have been killed. Earlier this month, a navy petty officer saved large number of civilian lives by promptly defusing a similar parcel bomb placed by LTTE terrorists at the Anuradhapura weekly fair.